(Phys.org) —A house window that doubles as a solar panel could be on the horizon, thanks to recent quantum-dot work by Los Alamos National Laboratory researchers in collaboration with scientists from University of Milano-Bicocca (UNIMIB), Italy. Their project demonstrates that superior light-emitting properties of quantum dots can be applied in solar energy by helping more efficiently harvest sunlight. "The key accomplishment is the demonstration of large-area luminescent solar concentrators that use a new generation of specially engineered quantum dots," said lead researcher Victor Klimov of the Center for Advanced Solar Photophysics (CASP) at Los Alamos. Quantum dots are ultra-small bits of semiconductor matter that can be synthesized with nearly atomic precision via modern methods of colloidal chemistry. Their emission color can be tuned by simply varying their dimensions. Color tunability is combined with high emission efficiencies approaching 100 percent. These properties have recently become the basis of a new technology – quantum dot displays – employed, for example, in the newest generation of the Kindle Fire e-reader. 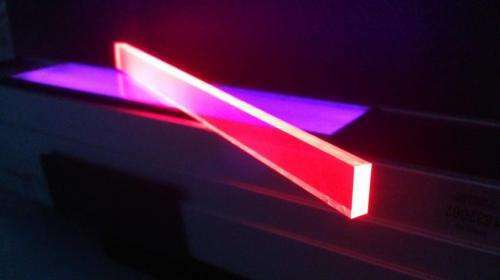 A luminescent solar concentrator (LSC) is a photon management device, representing a slab of transparent material that contains highly efficient emitters such as dye molecules or quantum dots. Sunlight absorbed in the slab is re-radiated at longer wavelengths and guided towards the slab edge equipped with a solar cell. Klimov explained, "The LSC serves as a light-harvesting antenna which concentrates solar radiation collected from a large area onto a much smaller solar cell, and this increases its power output." "LSCs are especially attractive because in addition to gains in efficiency, they can enable new interesting concepts such as photovoltaic windows that can transform house facades into large-area energy generation units," said Sergio Brovelli, who worked at Los Alamos until 2012 and is now a faculty member at UNIMIB. Because of highly efficient, color-tunable emission and solution processability, quantum dots are attractive materials for use in inexpensive, large-area LSCs. One challenge, however, is an overlap between emission and absorption bands in the dots, which leads to significant light losses due to the dots re-absorbing some of the light they produce. To overcome this problem the Los Alamos and UNIMIB researchers have developed LSCs based on quantum dots with artificially induced large separation between emission and absorption bands (called a large Stokes shift). These "Stokes-shift" engineered quantum dots represent cadmium selenide/cadmium sulfide (CdSe/CdS) structures in which light absorption is dominated by an ultra-thick outer shell of CdS, while emission occurs from the inner core of a narrower-gap CdSe. The separation of light-absorption and light-emission functions between the two different parts of the nanostructure results in a large spectral shift of emission with respect to absorption, which greatly reduces losses to re-absorption. To implement this concept, Los Alamos researchers created a series of thick-shell (so-called "giant") CdSe/CdS quantum dots, which were incorporated by their Italian partners into large slabs (sized in tens of centimeters) of polymethylmethacrylate (PMMA). While being large by quantum dot standards, the active particles are still tiny - only about hundred angstroms across. For comparison, a human hair is about 500,000 angstroms wide. "A key to the success of this project was the use of a modified industrial method of cell-casting, we developed at UNIMIB Materials Science Department" said Francesco Meinardi, professor of Physics at UNIMIB. Spectroscopic measurements indicated virtually no losses to re-absorption on distances of tens of centimeters. Further, tests using simulated solar radiation demonstrated high photon harvesting efficiencies of approximately 10% per absorbed photon achievable in nearly transparent samples, perfectly suited for utilization as photovoltaic windows. Despite their high transparency, the fabricated structures showed significant enhancement of solar flux with the concentration factor of more than four. These exciting results indicate that "Stokes-shift-engineered" quantum dots represent a promising materials platform. It may enable the creation of solution processable large-area LSCs with independently tunable emission and absorption spectra. A research paper, "Large-area luminescent solar concentrators based on 'Stokes-shift-engineered' nanocrystals in a mass-polymerized PMMA matrix," is published online this week in Nature Photonics.